#U2Request took place on April 14th, 2015. U2 fans from all over the world united with the goal to have their voices heard, voting for songs they would like to see played live on the new iNNOCENCE + eXPERIENCE Tour, starting on May 14th 2015 in Vancouver. Fans worldwide sent over 50K tweets to #U2Request, and 39K of tweets and retweets on April 14th from midnight to 23:59:59 their local time. "My name is Angelo D'Arezzo, and I am a U2 fan from Italy". #U2Request 1.0 - How it all came together. The idea for #U2Request was born at the beginning of last November. I read a post on Facebook by Andrea Morandi: "Which song would you like to hear on the new tour?" I thought to myself, this post will soon be forgotten, but what if we added a hashtag in front? So I wrote to Andrea, and he came back with #U2Request - short, sweet, and easy to remember. This is not where the idea stopped though. The release of Songs Of Innocence and the excitement about the new tour (that had not yet been announced) meant there was an opportunity for us to help get the fans' voices heard, as loud as possible. We reached out to U2 fans, to fan sites on Twitter and Facebook, in hopes of getting our hashtag to go viral as soon as the tour would get announced. The only rule was this was to remain a fan initiative, no logos, no trademarks added to it. The response was very good, and many fans showed their support. This is how I got to know James Parker (@TheeEdge) and Nicole Nahas (@U2Kouklitsa), who quickly became integral parts of the project. My friend Stefano Vaccaro created an image for us with #U2Request on it, and we started sharing it. And so did the rest of the U2 fans. As soon as the tour was announced, we started tweeting out #U2Request. The response was really good. Steve Lillywhite was kind enough to give #U2Request a nod, requesting 'A Celebration' - what a great honour for a fan initiative! 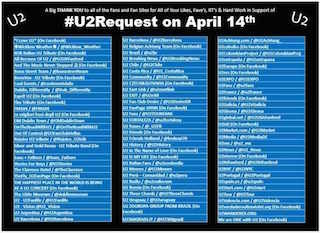 #U2Request 2.0 - April 14th 2015. The second phase started with Steve's ‘A Celebration’ - U2 have so many great songs, some rarely performed, some not at all. Why not turn this into a global U2 Celebration, show the world why we are U2 fans. What better time than with a newly announced tour, rumours about indoor venues, multiple nights per city and so on. We had to come up with a set date, to kick it off. After discussing this with Andrea, we thought exactly one month before the tour starts would be a good time. This found myself, James, and Nicole fully involved in getting the word out, almost 3 months before the 14th of April. Stefano kept providing us with artwork. This is a good time to thank all the U2 fan sites for their support. These are all people that work hard everyday to provide news about theirs and our favourite band. Part of our U2 Celebration would also be to recognise that and give back any way we could. Documentation, Harry's help & getting @U2's attention. 1) Some people did not fully understand the idea and thought it was our way of expressing dislike of previous U2 setlists or that we were trying to force our opinions to whoever might be listening from the band's associates, rather than for what it was: A Celebration! It’s true that sometimes you get misunderstood over the internet, especially when you speak a different language, and are restricted to 140 characters. The team came up with the idea a document, that would clear all confusion, and have instructions on how to participate. 2) How do we accurately count all the tweets from April 14th? I asked Harry Kantas (@harrykantas) for advice. 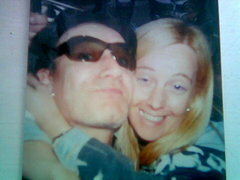 He and his wife Amra (@u2_ultraviolet) were always kind to our cause. Harry promised to work on a solution for us to have the exact counts of tweets on the day. A few hours later, we had a message from Harry, with a screenshot of some code running, and a comment: "It works ;-)". With our problems solved, we published our document, with all the details, links and instructions for #U2Request, along with a list of fan sites supporting us. This really kicked things off for us. We got many more people on board. 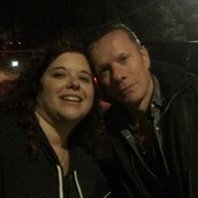 AJ Sams of U2wanderer.org wrote an article about us, and taught us a lot. The support of @U2Community came next, and Guy Oseary, U2's manager gave us a nod, by actively fav'ing and retweeting us. Then support from @U2 came along! Peter Rowen was even kind enough to let us use some of his artwork for our purposes. And that ‘s when the media also started taking notice. 14th of April 2015: World U2 Celebration. Starting at midnight at everyone's local time. Thousands of #U2Request tweets were coming in, we were trending in Italy, Brazil, Ireland and the US! Virgin Radio, Rolling Stone Italia in Italy. Universal Music in Italy, Spain, France, and Brazil. Olaf Tyaransen and Hot Press Magazine, as well as the Daily Mirror in Ireland. Sons and Fathers, Alzheimer Association supporting #ENDALZ, AfricanWellFund, the attention of Little Museum and other Irish Media. Steve Lillywhite was one of our first tweets from Thailand - where our friend James got the opportunity to meet him. Such an honour to have more than 50K tweets for #U2Request from all over the world. To have so many Fans actively participating by sharing images, videos, and of course their requests. To have the support of so many U2 sites, official or not, supporting us and tweeting for us. To have people, U2 fans or not, paying attention, spending an entire day talking about our favourite band. Such an honour to be here talking about this with all of you!